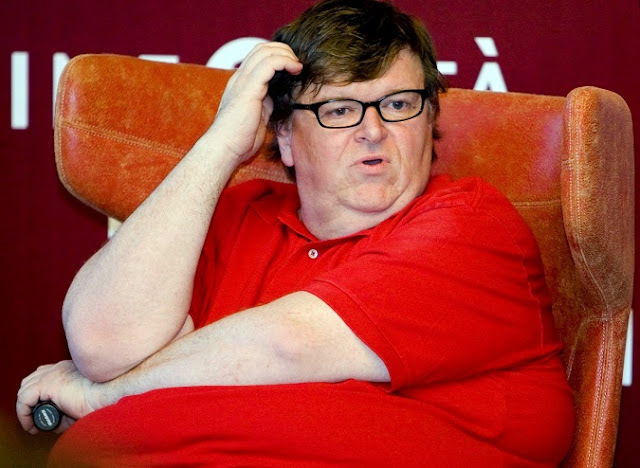 Bloated land whale, leftist kook and notorious waster of good celluloid film stock, Micheal Moore, has a message for the Anti-Trump Resistance forces - Your Mid-Term Vote Is All About Impeachment. At a Town Hall meeting with Bernie Sanders and Lizzy Warren, Moore's epic stupidity was once again, as they say in the moving picture business, the night's feature presentation. “I am optimistic. I have a thread of optimism still in me. I believe we will, in November, see a tsunami of people coming to the polls and after that I hope you, both of you, and the other senators, do their job,” Moore said during a town hall on “Inequality in America: The Rise of Oligarchy and Collapse of the Middle Class” organized by Sen. Bernie Sanders (I-Vt.) Monday evening. Moore urged the Democratic Party to also provide its “vision” to the voters rather than impeach Trump and go back to the day before he took office. “If we just get rid of Trump and we just go back to the day before Trump, how are things then, Sen. Warren and Sen. Sanders, with our healthcare, with our job situation, with poverty? I don’t want to go back to that day. We’ve got to move forward and we have to provide that vision and provide that leadership to make that happen,” he said." Well, at least Moore acknowledges the scam of Obamacare, the high unemployment and rising poverty during Barky's eight years in office, and even he doesn't want to go back there. MAGA! Moore went on to say America’s capitalist economic system is just not fair. Therein lies the reason no one should be listening to, or pay attention to anything this fat sack o" sh*t says. He's not even smart enough to know WE DON'T LIVE IN A DEMOCRACY. Besides, he said he was moving out of the country if Trump was elected. He's not only stupid, he's a liar to boot!